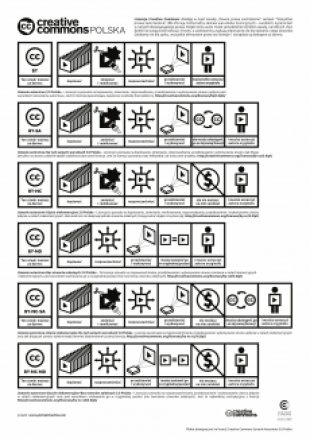 Creative Commons Poland is publishing special, open poster about CC licenses. Inspired by one organisation where we have seen hand drawn explanation of all licenses. Poster was designed by Piotrek Chuchla, graphic designer and poster artist and is downloadable in PDF and open SVG formats for print, remix and next translations. Download it in and open vectors package (poster and all used icons).